Federal and New Hampshire laws require employers to post notices informing employees of their rights and protections while performing work for their employers. 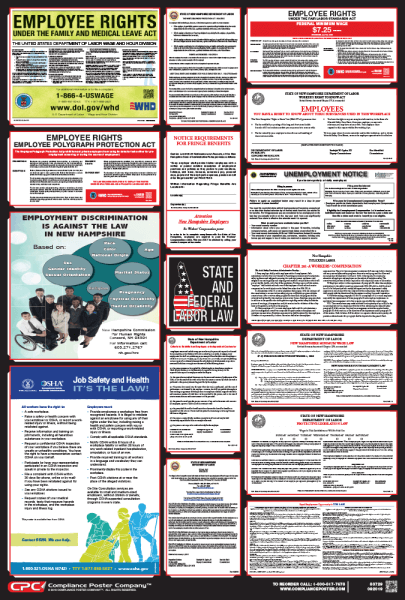 New Hampshire Labor Law Posters contain each of the mandatory state and federal labor law notices that must be posted in the workplace. 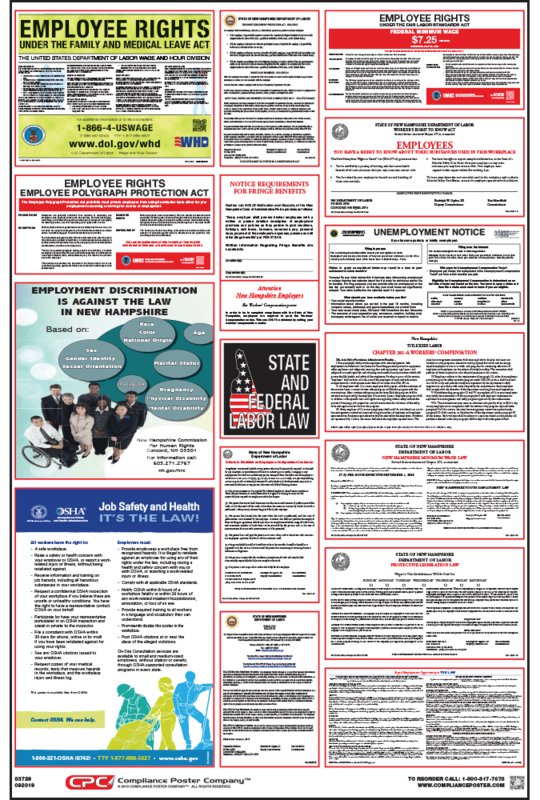 In New Hampshire, employers may also be required to post a separate city or county poster depending on their location, or specialized posters relating to their industry. This item has been placed on hold pending a legislative change or posting update. Should you need this item for an inspection or other immediate need, please call CPC at (800) 817-7678 to have the order shipped immediately. Otherwise, orders will ship as soon as the changes are available. (HB 1319) Gender Identity Discrimination, effective July 8, 2018. (SB 428) Wages must be paid within 8 days after the expiration of the work week if the employee is paid on a weekly basis, or within 15 days after the expiration of the work week if the employee is paid on a biweekly basis, effective July 29, 2018. Employers must obtain a Workers’ Compensation Notice from the workers’ compensation carrier and display it conspicuously in the workplace. Employers must provide employees with a written or posted detailed description of employment practices and policies pertaining to fringe benefits.